Pumpkins are part of the squash family, growing on long vines that ramble across the ground. 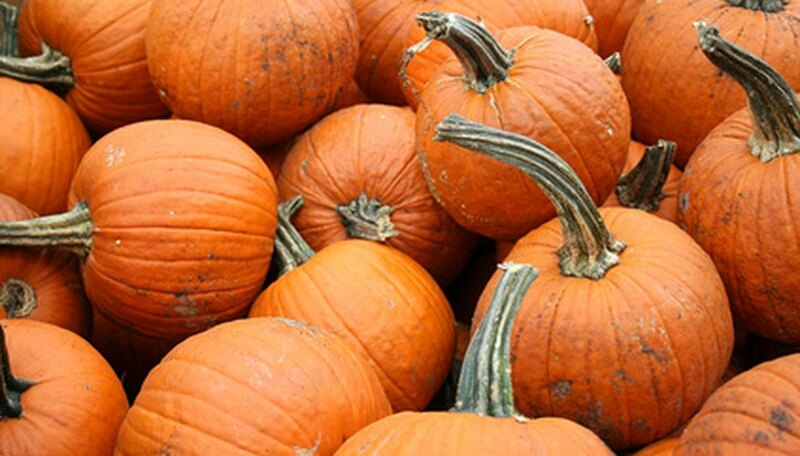 There are numerous pumpkin varieties, from plants that produce miniature pumpkins all the way up to jumbo pumpkins that can weigh in at 100 lbs. Pumpkins are extremely cold tender and must be grown when the soil and air temperatures are warm. Most of the work that goes into caring for pumpkin plants centers on controlling and training the vines. Water your pumpkin vine to moisten the soil evenly and moderately whenever rainfall is less than 1 inch each week throughout the summer. Control weeds growing around your pumpkin plant by hoeing them shallowly or pulling them by hand to avoid disturbing the pumpkin vine’s shallow roots. You can also spread a 3- or 4-inch layer of mulch around the plant to prevent weed growth. Train the secondary vines, or “runners,” to grow outward and away from the main pumpkin plant vine, arranging the secondary vines so they don’t cross each other or crowd together. Prune away any tertiary vines that grow from the secondary vines. Prune the pumpkin plant’s vines to control its growth. Cut the secondary vines so that they are no more than 12 feet from the main vine. You can also cut the main vine so it’s no more than 10 feet from the last pumpkin. Doing so will keep the pumpkin plant’s energy focused on producing the pumpkins instead of growing more or longer vines. Harvest the pumpkins when they achieve a deep color and sound hollow when you tap them with your finger. Cut the stem using a sharp knife or pruning shears and leave about 3 or 4 inches of the stem attached to the pumpkins. Pinch or snip off the fuzzy ends of each pumpkin vine when some of the pumpkins have begun to appear. You can cover the vines with soil to encourage secondary root growth and larger pumpkins. Avoid using insecticide sprays on your pumpkin plants unless absolutely necessary, because the insecticides can also kill the bees that pollinate the plants. If you must spray an insecticide, do so only late in the afternoon or early evening, after the bees are away from the flowers.